Learn about North Fort Myers? Captiva Island girls getaway. Opens in a new window. Beach bliss on Sanibel Island. Opens in a new window. My wife and I did a three day getaway and stayed in the tennis villas. Lots of privacy yet close to everything. Very spacious and clean villa. South Seas Resort does it right. They seem to pay attention to the little details that really make or break a vacation resort. Will be back again. Highly recommend! Despite having to take a boat to the shared beach, the resort was amazing. There were so many activities for kids! A rock wall, putting green, water slides, bounce houses, a show, contests, and corn hole. Travel to/from the airport was simple as well. Great family atmosphere! Where to find North Fort Myers hotels near an airport? Where can I find hotels in North Fort Myers that are near tourist attractions? You'll find a number of accommodation options to consider when it's time to start organizing your vacation in North Fort Myers. You'll find approximately 11 apartments and hotels within a 0.1-kilometre (0.06-mile) distance of the heart of North Fort Myers which are part of Expedia's network. Expedia hotels within driving distance of North Fort Myers include the Hotel Indigo Fort Myers Downtown River District and Legacy Harbour Hotel & Suites. 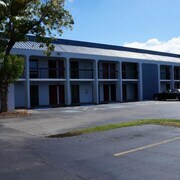 The Travelodge Fort Myers North is one of a few budget lodging options in North Fort Myers. The Pink Shell Beach Resort and Marina is located 30 kilometres (19 miles) from the center of North Fort Myers. Alternatively, the Resort Harbour Properties is situated 30 kilometres (19 miles) away. The Sanibel Harbour Marriott Resort & Spa as well as the Harbour House At The Inn are two other recommended Expedia-listed hotels around North Fort Myers. Once you have got to know North Fort Myers, why don't you tour a bit more of the area? The South Florida district has a number of things to see. Check out South Florida's lighthouses and enjoy the area's beaches and everglades. Popular activities in this particular part of United States of America include hiking. 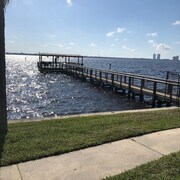 Cape Coral is 20 kilometres (13 miles) to the southwest of North Fort Myers and is where you'll find Sun Splash Water Park and Four Mile Cove Ecological Preserve. The Holiday Inn Express Cape Coral-Fort Myers Area and Dolphin Key Resort are a few of the Expedia-listed short and long-stay alternatives in Cape Coral. Or, you could stay in Fort Myers Beach, 30 kilometres (20 miles) to the south of North Fort Myers, where you can choose from the Diamondhead Beach Resort and Spa and The Neptune Resort. 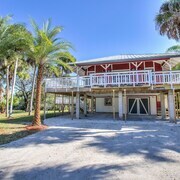 While visiting Fort Myers Beach, a couple of places to add to your itinerary are the Mound House and Santini Marina Shopping Plaza. Get your sporting fix by making a journey to Arcadia Rodeo Arena, which is 55 kilometres (33 miles) to the north of North Fort Myers. 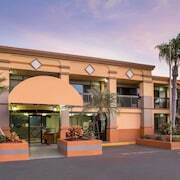 Sleep right near the action at the Holiday Inn Express Hotel and Suites Arcadia or the Knights Inn Arcadia. If you are planning on flying via Southwest Florida International Airport, you might like to stay at Courtyard by Marriott Fort Myers I-75/Gulf Coast Town Center, or SpringHill Suites by Marriott Fort Myers Airport, which are both conveniently located nearby. What are the most popular North Fort Myers hotels? Amazing Backyard !!! Swimming Pool !! Vacation House River Garden ! 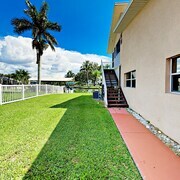 Pool Home With Water Front View , Grill, 10 Minutes Yacht Club Beach! Are there hotels in other cities near North Fort Myers? 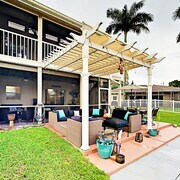 What other types of accommodations are available in North Fort Myers? Explore North Fort Myers with Expedia.ca’s Travel Guides to find the best flights, cars, holiday packages and more!